It is now generally accepted that the type and amount of dietary fat can affect the genesis and course of experimental atherosclerosis [307, 410, 466, 517, 807, 829, 841, 862]. Moreover, epidemiological studies clearly indicate that the type of dietary fat has a distinct influence on coronary artery disease (CAD), which is one of the clinical manifestations of atherosclerosis [363, 442, 689, 781]. Human prospective studies also showed that diets low in long chain saturated fatty acids enriched with linoleic acid are beneficial to CAD-prevention [175, 487, 552, 818]. As demonstrated in Chapter 1, there is a close relationship between arterial thrombosis and atherosclerosis, although this relationship is not exclusive [157, 158, 602, 762, 842]. 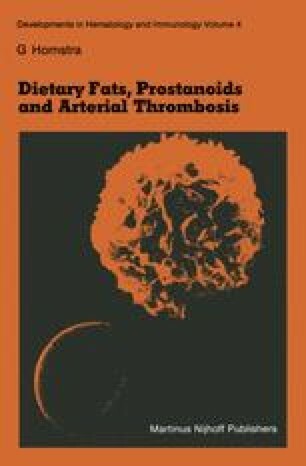 However, as atherosclerosis is a multifactorial disease , the dietary fats may, at least in part, be effective through their influence on arterial thrombosis.